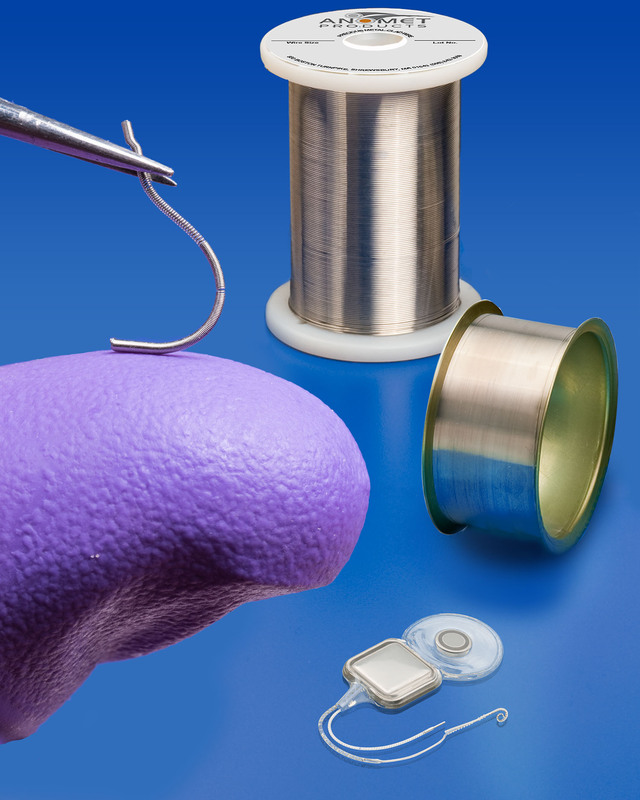 Custom engineered composite medical wire for medical equipment OEMs that can combine properties such as a high strength interior and corrosion resistant exterior is available from Anomet Products of Shrewsbury, Massachusetts. and leads requiring properties such as a conductive interior with a bio- compatible exterior or high strength and corrosion resistance, this wire provides greater ductility and formability than filled or plated wire. Available in sizes from .002” to .125” (.05mm to 3mm) O.D. with 2% typical cladding thickness, Anomet Medical Implant Wire can feature precious metals on the exterior for properties such as radiopacity, bio-compatibility, and contact-resistance. Interiors can include copper, stainless steel, MP35N, Nitinol®, nickel-iron, niobium, palladium, tantalum, titanium, and others. Anomet Medical Implant Wire is priced according to configuration, size, and quantity. Samples and price quotations are available upon request.